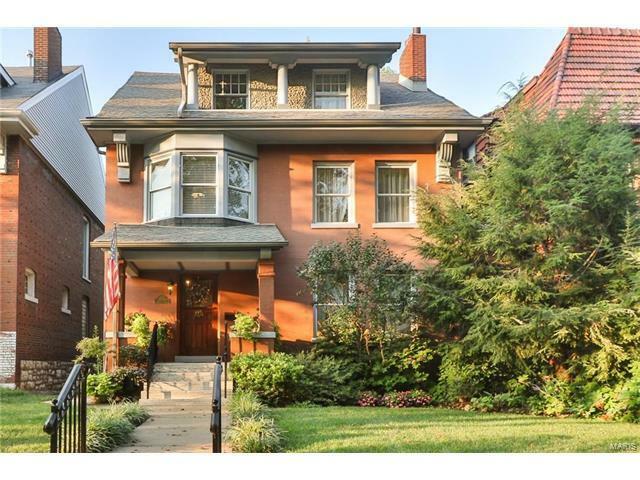 Beautifully updated CWE home on gated street w/gorgeous details. Fully updated for today's lifestyle, perfect flow for entertaining. Enter into a charming foyer with period wood staircase, leading to large bright living rm w/custom marble fireplace. Pocket door entry to formal dining rm w/box beam ceiling. Open kitchen, butler's pantry and wet bar all with granite counters & stainless steel appliances, leading out to fantastic 12 x 12 screened-in 3-season porch. New wood floors throughout main level. 2nd floor master suite features tiled gas fireplace, luxury master bath w/ His-n-Hers closets, double sinks, glass over-sized shower and separate over-sized tub. Guest bath on 2nd floor also fully renovated/updated. 2nd floor laundry. 3rd floor offers 2 large bedrooms, lg bonus room/den and full J&J bathroom. Over-sized 3-car garage. Newer windows, electric, plumbing, roof, sewer lateral and roof. Walking distance to shops, restaurants, Metro, blocks to Forest Park, Wash U and Hospitals. Kingshighway to McPherson, east to Walton. North on Walton, to Westminster Place, west on Westminster Place to 4753.